Resource Recovery, Just Do It? Europe’s key biorefine players met within the EU Bioeconomy Policy Day (see below). Leading biorefine companies (Booregaard Norway, Clariant, UPM Biofore) presented operating plants in the 50+ kt/y scale, showing a range of different models: forest by-product input or crop by-products, economics driven by biofuels or by chemical products refining. Discussions underlined the challenge of adjusting the current bioenergy subsidy/obligation policy to enable continuing development of biofuels from by-products, whilst not artificially competing out biorefining of added-value chemicals which valorise chemical functionalities of natural molecules. 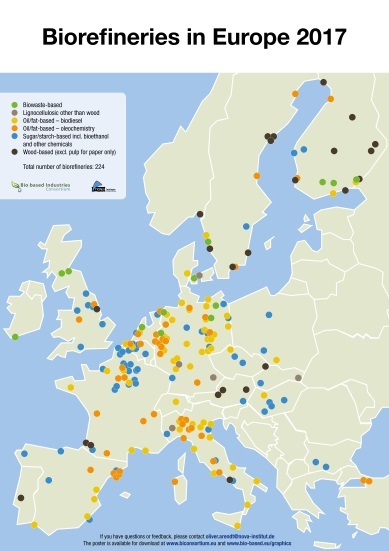 The Bio-Based Industries Consortium (BBI) presented a map now online showing nearly 200 full-scale biorefineries operating today across Europe (see www.bio-based.eu/graphics). The workshop proposed recommendations to the EU’s BioEconomy Strategy, including clarifying sustainability criteria for biofuels based on the cascading use principle (material reuse and recovery of chemicals as priority, preferable to biofuels or energy production). The European Commission has opened a public consultation on the risks from pharmaceuticals in the environment (open to 21st February 2017). This follows a consultation on the “pharmaceuticals roadmap” in Spring 2017. ESPP responded underlining the need for more information to ensure safety and develop public confidence in recycling of organic products (composts, digestates, etc.) from manures and sewage biosolids. The current consultation is based on a 25 page document, which assesses 30 possible public policy options based on a scientific research review and stakeholder consultation. These include developing knowledge - data and risk assessments, “greener” pharmaceutical design, rationalising pharmaceutical use, pharmaceutical waste collection and “more effective management of waste water, manure and sludge”. Here, options noted include wastewater treatment in hospitals, water treatment and “better source control through better handling of manure, sewage sludge, and water reused for irrigation”. The consultation asks several short questions about awareness of pharmaceuticals in the environment, and possible priority actions to address risks, then enables submission of comments on possible actions, information sources and actions underway, and is open to public response. The Bioeconomy Day, 16th November, Brussels, was co-organised by nine different European Commission Directorates: Research, Growth, Agriculture, Climate & Energy, Regions, Environment, JRC, Oceans, Santé, with input from the Commissioners for Research and Agriculture and from MEP Simona Bonafé, rapporteur for the Waste Framework Directive revision. Joanna Dupont-Inglis, European Association for Bioindustries, presented the Bioeconomy Stakeholders Manifesto, just published. This refers to the need to “improve food, nutrition and water security”. She noted that this detailed position obtained consensus of nearly all the participant stakeholders, but that a small number finally did not sign because of divergences over the inclusion in the document of the need for reform of the EU Common Agricultural Policy (CAP) and the principle that there are limits to biomass production. Chris Thornton, European Sustainable Phosphorus Platform (ESPP), presented on developing the nutrient Circular Economy, explained the need for regulatory support (in particular the EU Fertilisers Regulation, standards, nutrient discharge regulation …) but also the need to go beyond this and address the market and economics: public procurement policies, enabling farmers to transfer sustainability costs to supermarkets and consumers, transfer of the fiscal burden from employment to energy and resource consumption. The Day’s main conclusions were needs for: a clear and stable policy framework, for policy coherence across different European Commission services, for support both for innovation and for scale-up to market, for monitoring and indicators, and for new business models and supply chains. ESPP has submitted positions to the two recent EU public consultations on water policy: evaluation of the Urban Waste Water Treatment Directive (WWTD) and of the Water Framework Directive (WFD). ESPP underlined the importance of these two regulations in improving EU water quality, and the economic and social value this bring. ESPP underlined the need to extend these policies to better take into account nutrient stewardship and recycling, return of organic carbon to soil, biodiversity. ESPP notes the economic challenges of implementing water treatment and reducing agricultural nutrient losses, in particular cost recovery (as is required by the Water Framework Directive) and the need for innovative economic tools such as catchment permitting or nutrient emissions trading. ESPP presented at the Food & Drink Business Europe conference, Coventry UK, 7th October, on the challenges of nutrient stewardship in food production and phosphorus in diet. Other speakers at the conference included PepsiCo, WWF, Jackson Foods UK, Jordans-Ryvita, ADAS, NIS Nutritics, Véolia, BASF, Cargill … Chris Thornton, for ESPP, reminded that nutrient input is essential for food production: we could feed maybe one fifth of the world’s current population without mineral fertilsers. Yet, in Europe, we consume around twice as much phosphorus in our diet as we need as a nutrient (in meat, vegetables, and maybe 5-10% as phosphate food additives). These increased levels of diet phosphorus raise questions about their possible health impact, with a need for more scientific research. Elevated blood phosphorus levels seem to be correlated to cardiovascular disease risk (CVD), but available evidence does not suggest that diet phosphorus is linked to blood phosphorus, which is regulated by the kidneys in healthy individuals. Better information about food phosphorus is however critical for kidney disease patients (CKD), that is c. 30 million people in Europe*. * Based on Ketteler, in SCOPE Newsletter n°125: 7% of the population. A new report by the Sustainable Food Trust shows that the real cost of food in the UK is twice what consumers pay in shops, because of hidden costs (externalities). For UK£1 paid for food, environmental damage costs an additional 50 pence, that is costs which are born by society either today or our children: pollution, climate change, soil degradation, biodiversity loss. Health care costs (born by taxpayers in national health systems, in fact principally by taxation on jobs) costs a further 37p. One of the biggest negative externalities for which a cost estimate is today available is the use of nitrogen fertilisers (see page 29 of the report). A further 10.5 pence goes to administrative, research, regulatory costs and for food imports. And just 2.5 pence is farm subsidies. Listen on BBC Farming Today replay. Struvite fertiliser availability varies significantly as a function of soil magnesium, according to a study on struvite recovered from urine for fertiliser availability in three South African soils. The study uses phosphorus adsorption equilibrium, soil incubation and six week maize pot trials. The three soils were Inanda, Sepane and Cartef types with phosphorus equilibrium contents of 1.39, 0.17, 0.13 mgP/l, buffer coefficients of 454, 71 and 50 mg.kg/mg.l and pH 4.8, 6.9 and 6.8. Struvite was applied at 0.5, 1 and 2 times recommended application rates, which were 20, 60 and 80 kgP/ha for the different soils, plus a control (no fertiliser) and single super phosphate (SSP, at recommended application rate). Maize responded better to struvite than to SSP on the Cartef soil, but better to SSP on the Sepane soil (even when struvite was applied at twice recommended application rate), and showed no response to either fertiliser on the Inanda soil. The Sepane soil has ten time higher exchangeable magnesium than Cartef soil (Sepane = 8.6 cmolc/kg) so it is logical that struvite phosphorus is poorly available in this soil, because the magnesium will impact the solubility product. A report for the Netherlands Government assesses possibilities for recovery of nutrients (other than phosphorus and nitrogen) from waste streams. 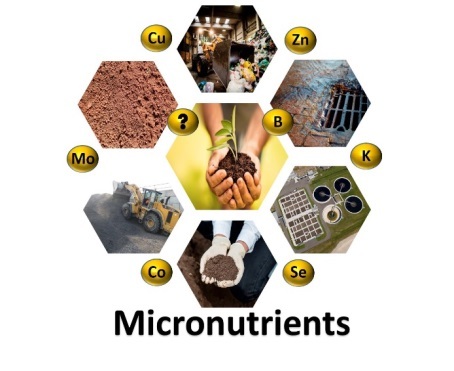 Based on criticality of mineral resources and importance for agriculture, priorities are identified as: boron, cobalt, copper, potassium, molybdenum, selenium and zinc. Waste streams considered include sewage, industrial wastes, municipal solid waste, animal by products, coal ashes and other ashes. The report recommends further research into agricultural use of sewage biosolids (after e.g. composting) but notes the need to address possible risks of organic contaminants. The following recovery routes are identified as having potential: bioleaching and phytoremediation (plant uptake of metals), polymer assisted ultrafiltration (PAUF), fly ash wasting / metal separation (FLUWA) and the Ecophos process (recovery of other nutrients in the residue after phosphorus recovery). Particular potential is noted for zinc and potassium from sewage sludge, Ecophos residues and municipal waste incineration bottom and fly ash (MWIP); copper from MWIP; boron, cobalt and selenium from coal ashes. A report to support the Biorefinery Roadmap for Scotland (2015, Scottish Enterprise) identifies 27 million tonnes/year of organic waste and by-product flows which could be better valorised. In particular, sewage biosolids, food waste, animal waste, agri-food industry by-products (distilleries 3 Mt/y, cheese making 0.5 Mt/y), potato and carrot processing, forestry, bakery wastes, and coffee grounds. To valorise these resources, actions considered necessary include better data on flows to identify geographical opportunities for biorefineries, better quality information on food waste and animal waste streams, increasing use of organic fertilisers, addressing regulatory barriers (e.g. to use of organic fertilisers), explore synergies between energy and biorefineries, investment in technologies to address logistics (de-watering, bioresource stabilisation for storage, transport). It is noted that phosphorus can be recovered in proteins for animal feed (e.g. via insect larvae), through technical recovery routes, or through organic fertiliser materials. EFPRA, the European animal by-product processing industry federation, has published a fact sheet on the need to recycle phosphorus and the advantages of recycled phosphorus products recovered from slaughterhouse by-products. EFPRA estimates that among their members the rendering and slaughterhouse by-products processing industries in Europe recycle around 95 000 – 130 000 tonnes of phosphorus annually to livestock feed, pet food and fertilisers. This is estimated to represent 75% of the supply in the whole sector. In particular, food-grade bones from slaughterhouses are processed to produce gelatine (for the food and pharmaceutical industries) and to recover phosphorus as DCP (di calcium phosphate). Another recovered phosphorus product is de-limed bone meal (hydroxyapatite – tri calcium phosphate TCP).These recovered phosphorus products offer low contaminant levels, good phosphorus availability for livestock or plants, and safety and traceability from origin. The first Annual Critical Raw Material (CRM) Event, 7 November 2017, Brussels, was co-organised by the European Commission (EC), with the Horizon 2020 projects SCRREEN, CHROMIC, EQUINOX, INREP, PLATIRUS and SCALE. It took place in parallel to the Advanced Mining Countries Conference on Responsible Mining and Sourcing. EC DG GROW presented the outcomes of the Critical Raw Material Assessment 2017, to which ESPP input, and which led to now include white phosphorus (P4) additionally to phosphate rock on the EU List of Critical Raw Materials (see eNews 15). SCRREEN is hosting the EU CRM network gathering European initiatives, associations, clusters, and projects working on CRMs to contribute to Europe’s CRM strategy in Europe. The Raw Materials Information System (RMIS) was presented by the EC Joint Research Centre (JRC), which is a structured repository of knowledge, data, methods, approaches and indicators on non-energy-related raw materials. Also presented was the SusCritMat project which aims to educate people from Master's student level up, both in industry and academia about important aspects of sustainable CRMs. The other projects presented focus on metals recovery including efficient mineral processing and hydrometallurgical recovery of by-product metals from low-grade metal containing secondary raw materials. The Dutch Water Network (KNW) organised a symposium, 9 November 2017, Wageningen Netherlands, on the recovering and recycling of resources from waste(water). This symposium brought together resource recovery projects, discussing drivers and barriers of economic viable pathways of recycling. ESPP gave a presentation about the opportunities and challenges for nutrient recovery from wastewater from an EU regulatory context. Other nutrient related presentations focussed on the potential future technologies to recover carbon, sulphur, nitrogen and phosphorus (WETSUS), and the recovery of sulphur from biogas applied as fertilizer in agriculture (Fertipaq by PAQUES), making mainly use of electrochemical and biochemical processes, and resulting in a product with agronomic properties better than petrochemical origin sulphur. Examples of pilot scale research into the recovery of the important micronutrients zinc and selenium were presented. One of the main conclusions was that technologies are available to recover many different resources, but that the recovery process is just a first step. Application of the recovered resource, and making a positive business case are two aspects that are at least as important. Necessary questions in setting up a viable business case were discussed, for example (1) in which form to supply the resource/nutrient to the market, (2) how to collect and transport, (3) who will be the customers; farmers; distributors, (4) Is a permit or end-of-waste status required for its application, (5) how to organize the business structure, and (6) how to integrate a new innovative activity in an existing company. Ludwig Hermann, ESPP President and Outotec, spoke on phosphates at the 10th International Resource Availability Conference, Oxford, UK, in cooperation with Kazuyo Matsubae, Tohoku University, Japan. They highlighted the need to respond to resource challenges to ensure supply of phosphate for agriculture and food security, a non-substitutable input. They noted the low use efficiency and large waste flows containing phosphorus, and discussed commonalities and differences of policies and technical developments in Europe and Japan. The conference identified a shared concern, for different raw materials, about reduced mining productivity leading to cost increases. The long timespans from the decision of opening a new mine to actual production was underlined. A life cycle analysis (LCA) study compares 17 different recycling routes, and with phosphate rock (applied directly to soil) and triple super phosphate mineral fertiliser. 11 of the 17 routes showed positive for most of the environmental impacts considered. In particular, anaerobic digestion/digestate show positive impacts (due to renewable methane energy production and conservation of nitrogen), as do direct application of sewage biosolids to agriculture, use of biomass ash and use of meat and bone meal ash. Application of sewage sludge incineration ash to land (which is not realistic in any case, because of contaminants and low phosphorus availability) shows less positive LCA results, because most of the energy recovered in incineration is consumed in necessary prior sludge drying. More complex phosphorus recovery processes studied (technical phosphate recovery from sludge or ashes) showed higher energy demand and greenhouse emissions than mineral phosphate fertilisers, but lower impact on resource consumption (phosphate reserves). The authors note that recycling of other elements (nitrogen, potassium) significantly impact the LCA results of different phosphorus recycling routes. A paper by 90 scientists identifies seven priorities for research into organic phosphorus (P-org) in soil and agriculture. The authors note a considerable increase in publications concerning P-org from around 150 in 2000 to 400 in 2016. The paper is based on contributions of participants at a workshop on organic phosphorus in the UK in 2016 (www.op2016.com) so may not be a representative set of experts. A better understanding of organic phosphorus in considered important to enable a better use of organic recycled fertiliser materials, so contributing to food security and to limiting phosphorus pollution. P-org can cover both organic molecules containing phosphorus, and inorganic phosphates bound to organic material. The research priorities identified are: methodologies, stoichiometry with other elements in organic matter, dynamics of P-org in soils and land use systems, role of micro-organisms, interactions with nanoparticles (soil colloids, man-made), functional genes and metagenomics, measuring soil stocks – mineralisation, and cycling in soil, modelling, communication of research. 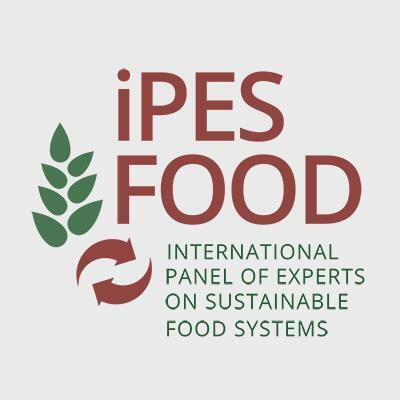 An ambitious report from iPES FOOD (International Panel of Experts on Sustainable Food Systems) assesses the impacts of food and agriculture on human health, considering impacts of diets on health, environmental effects and occupational impacts on farmers and workers including livelihood stresses, as well as food insecurity. Unhealthy diets result in health costs (obesity, diabetes, heart disease, cancer …) of over 8 trillion US$/year. Added sugars, sodium, saturated fat, and trans fat, and a lack of fruit and vegetables, grains, and nuts and of micronutrients are cited. Environmental impacts include climate change and nutrient losses. Actions called for include promoting food systems thinking, independent science and integrated food policies involving all concerned stakeholders. Another report by WWF also criticises today’s food system underlines the environmental impacts of meat production, both red and white meat, through land demand for animal feed crops. WWF also suggest that intensive livestock fed on energy- and protein-rich feed crops show higher unhealthy saturated fat content and lower omega-3 fatty acids in meat. A paper from the USA suggests that accumulation of fixed nitrogen in the environment poses planetary environment risks, as the biosphere’s denitrification capacity could fail to keep pace. Anthropogenically fixed nitrogen (from mineral fertilisers and nitrogen-fixing crops) today accounts for around half of all fixed nitrogen annually, and is around five times higher than 60 years ago. Fixed nitrogen can lead to biodiversity loss (as natural species are competed out by species able to grow rapidly with high nitrogen levels), greenhouse emissions (especially nitrous oxide), eutrophication, nitrates in water supplies (accused of contributing to cancers and miscarriages) and ground-level ozone (harmful to human health and to vegetation). This is despite the increase in nitrogen use efficiency in agriculture over past decades: nitrogen fertiliser use has not increased since the 1990’s whereas agricultural production continues to increase. Phosphates 2018 conference , Marrakesh, Morocco - Website - the fertiliser, feed and industrial phosphates industries.